The material used by our companyis high carbonchromium bearings steel GCr15-GB/T18254 equivalent such as AISI52100(USA),DIN100Cr6(Germany) JISSUJ2(Japan) and BS534A99(UK). The materials for cages must have strength to with stand rotation at load and shock load. Low frictional efficiency light weight and be able to with stand operation temperature. The material used in ribbon cages or crown cages is 08F or SPCC pressed. It is chemical compositionis shown for extra-high speed application. Plastic cages such as glass reinforced polymideareused. These plastic crown have the advantages oflow torque,long grease lefe and low noise,etc. ● The measuring parameter of vibration adopted by RNB is the vibration acceleration of vibration velocity. ● The measuring units and measuring method are specified by JB/T5314 and JB/T5313 In the process of measuring vibration strictly controlled noise by using acoustics. Single row deep groove ball bearings are manufactured with Normal radial internal clearanceas standard. 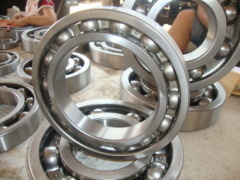 Most of the bearings are also available with C3 radial internal clearance. Some of the bearings can also be supplied with as maller C2 clearance or the much greater C4 or C5 clearances. In addition, deep groove ball bearings are available with reduced or displaced internal clearance ranges. These special clearances may use reduced ranges of standard clearance classes or partitions of adjacent classes, see designation suffix CN insection. Single row deep groove ball bearings are manufactured as standard to normal tolerances. -0/–100 μm for larger bearings. - Normal tolerances for larger bearings. For bearing arrangements where accuracy is a key operational factor, some SKF single row deep groove ball bearings are also available with accuracy completely to P6 or P5 tolerance classs pecifications.The availability of these bearings should always be checked before ordering.